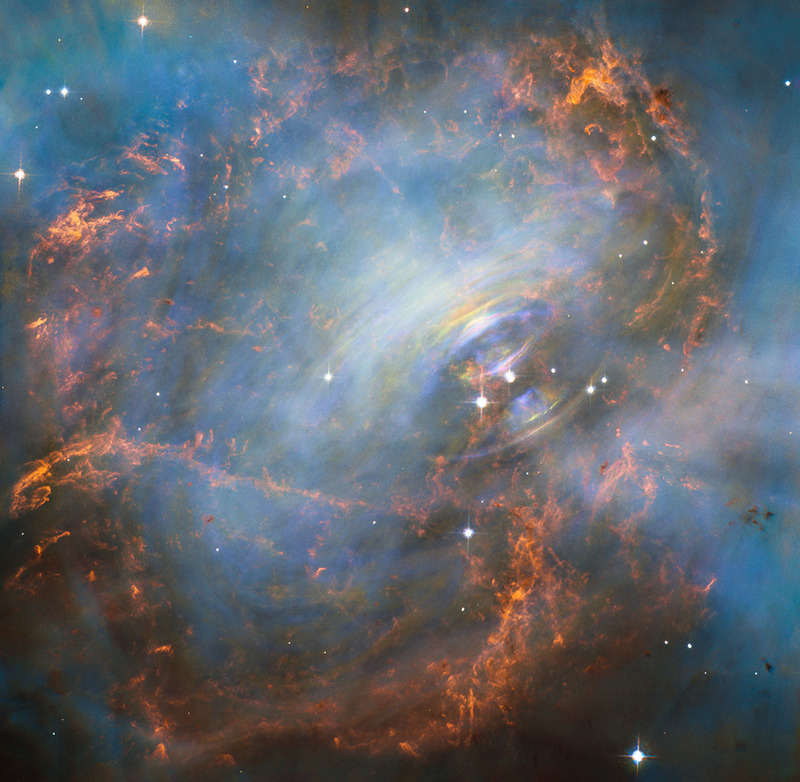 Explanation: At the core of the Crab Nebula lies a city-sized, magnetized neutron star spinning 30 times a second. Known as the Crab Pulsar, it's actually the rightmost of two bright stars, just below a central swirl in this stunning Hubble snapshot of the nebula's core. Some three light-years across, the spectacular picture frames the glowing gas, cavities and swirling filaments bathed in an eerie blue light. The blue glow is visible radiation given off by electrons spiraling in a strong magnetic field at nearly the speed of light. Like a cosmic dynamo the pulsar powers the emission from the nebula, driving a shock wave through surrounding material and accelerating the spiraling electrons. With more mass than the Sun and the density of an atomic nucleus, the spinning pulsar is the collapsed core of a massive star that exploded. The Crab Nebula is the expanding remnant of the star's outer layers. The supernova explosion was witnessed on planet Earth in the year 1054.